The #10YearChallenge has sparked a lot of thoughts early 2019. 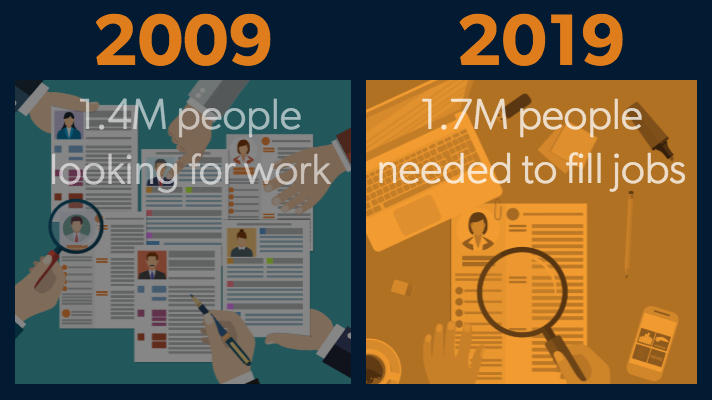 Let's take a look back at how the labor market has changed in 10 years! In 2009, there were only 2.1 million job openings, while 3.5 million people were leaving their jobs - leaving an overage of 1.4 million people looking for work, based on what was available. 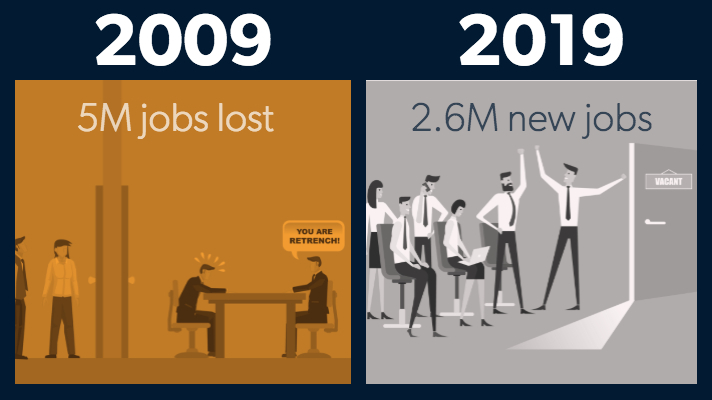 Ten years later, the job market has gone the opposite with with 6.8 million job openings, while 4.8 million people are quitting their jobs - with the shortage of talent to fill jobs at a staggering 1.7 million. The job market in 2009 accurately paints a picture of how hard the Great Recession hit - with 5 million jobs lost. Unemployment at 9.9%, largely due to company layoffs and reduction of forces. Fast forward to 2019, 2.6 million new jobs were added in the span of a year, and unemployment at one of it's lowest rates of 3.9% - mostly attributed to workers quitting jobs for new opportunities. Average monthly job growth in 2010 was approximately 79k per month. 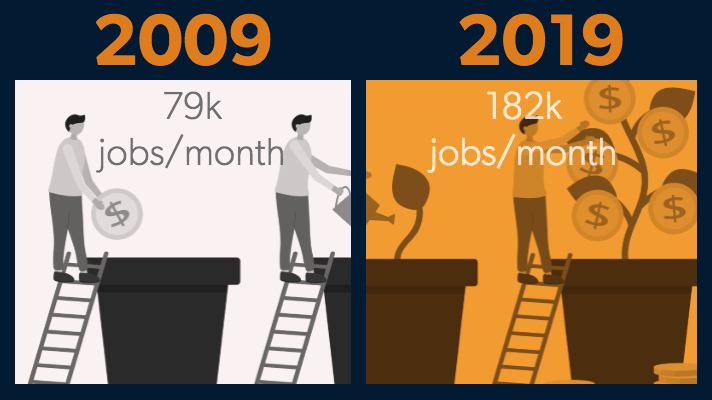 Ten years later, the projected monthly job growth for 2019 is 182k jobs per month! Over 110k increase in monthly growth during this past decade. 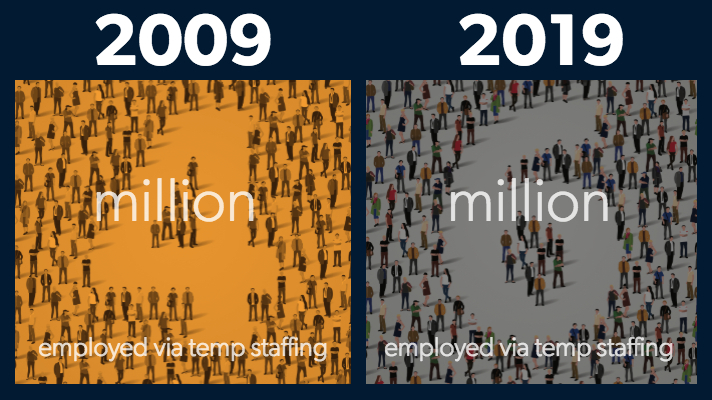 Employment in temporary staffing (non-IT &IT) increased from 4 million in 2009 to 6 million in 2019, showing increased reliance on staffing agencies by employers to fill jobs in light of the current talent shortage. 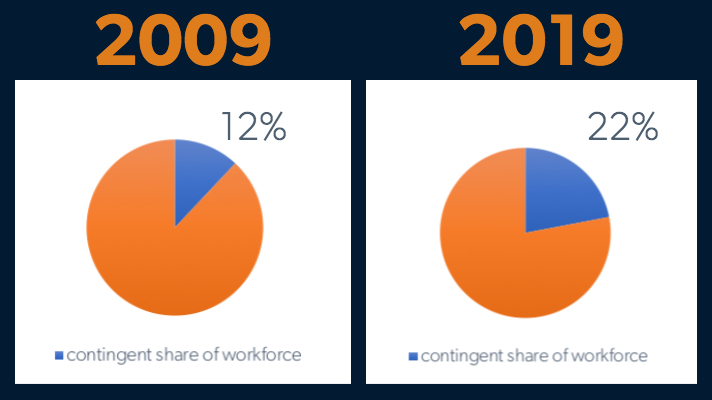 The share of contingent workforce has jumped 10% in the past decade. 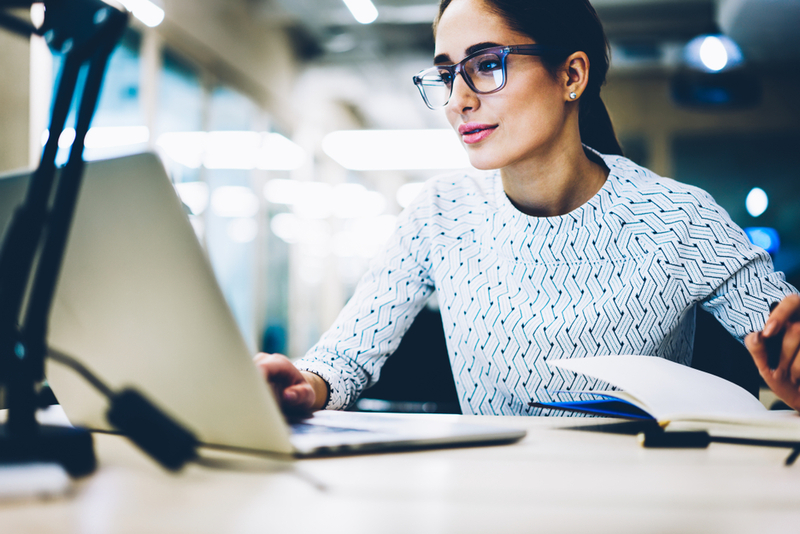 Along with this, the share of companies using a MSP has jumped from 49% in 2009 to 68% in 2019, as companies work to manage costs, processes, compliance, and data analytics related to the growing contingent workforce. 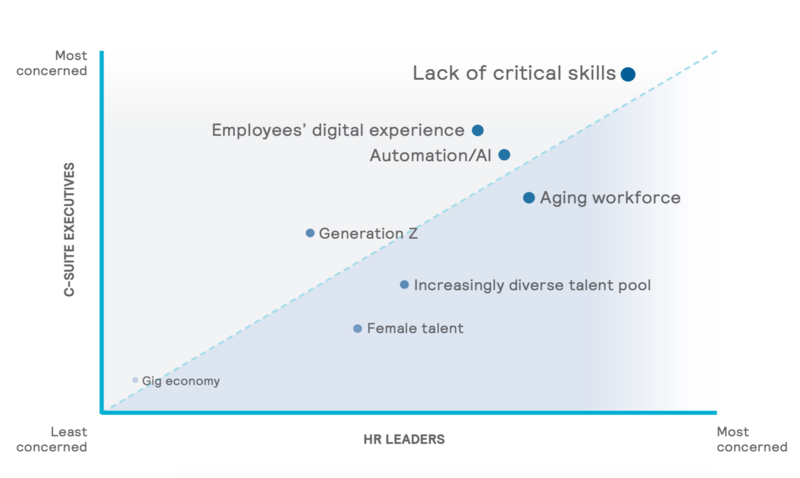 While we cannot predict the future, it will be interesting to see how the labor market and contingent workforce change and evolve over the next ten years. What do you predict? Krista Palmisano has nearly 15 years of experience in providing market and business analytics. 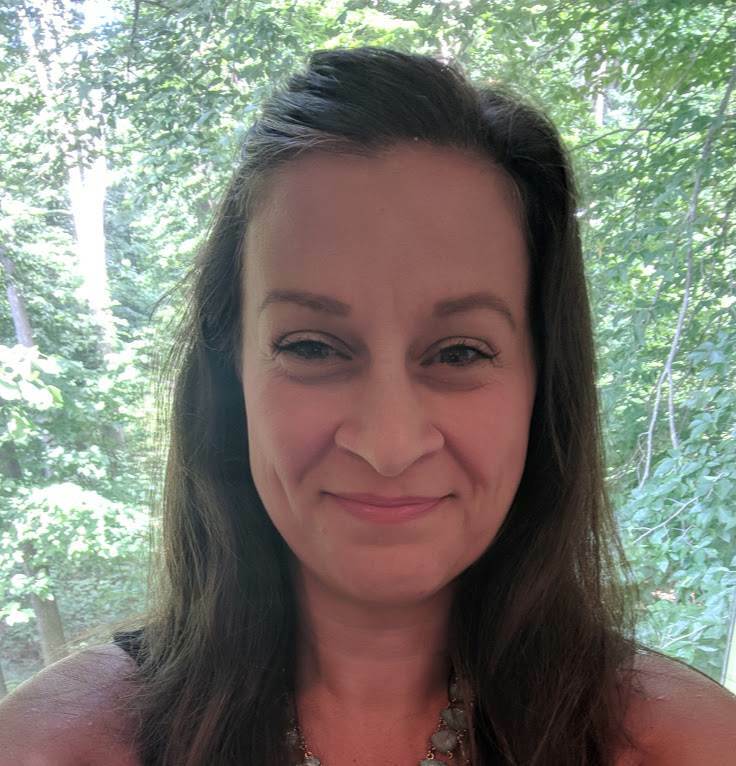 Starting her career with Allegis Group at TEKsystems in 2000 as a Market Research Analyst, Krista participated in and supported annual company strategic planning sessions with senior management by incorporating research data into company planning. She also conducted all phases of customer surveys, managed a market segmentation and branding study used to create company value proposition and supported 85 field offices with market research. From there, Krista moved onto a Lead Analyst role with a technology startup, where she oversaw all aspects of project data life cycle for clients and managed a team of six analysts. Returning to Allegis Group in 2010 to work at Allegis Global Solutions (AGS), Krista moved into a Lead Research Analyst and then Senior Manager role specializing in labor market economics and the impacts on local labor pools, as well as assisting clients with workforce planning initiatives such as site selection planning and global workforce mapping. Key areas of focus include: conducting labor market analysis across the US, EMEA and APAC using a variety of data sources including DOL, BLS, Census, ONS, Eurostat etc. ; supporting client consulting engagements to assist clients in workforce planning, placement and costs; building and advising clients on rate strategies and rate cards to manage contingent labor costs; publishing voice of the market research for clients and industry groups. Krista attended Roanoke College where she earned a Bachelor of Science in Psychology with a concentration in research design and analysis.